Burlington, CT. 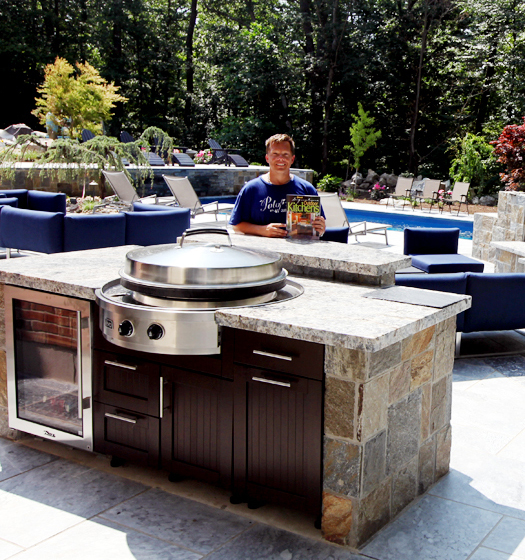 Looking to transform their backyard into a relaxing oasis, these homeowners consulted pro designer Michael Gotowala to create an outdoor kitchen and living space that is perfect for entertaining or just hanging out with the family. 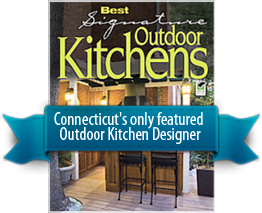 Gotowala and his team at Preferred Properties Landscaping & Masonry are no strangers to the intricacies of outdoor design, with Gotowala having spent his career making a name for himself in luxury outdoor kitchens. In order to achieve the look and feel the homeowners sought, Gotowala made one of his first goals to maximize and expand the space available. He achieved this by installing an outdoor island that was raised up to the deck height. This island, made of offset stone, allowed Gotowala to remove the deck rails, elongating the workspace and creating a pleasing effect on the eye. Within the island, Gotowala set a DCS 30-inch grill that, along with the Summit glass-front refrigerator, makes cooking outdoors a snap. 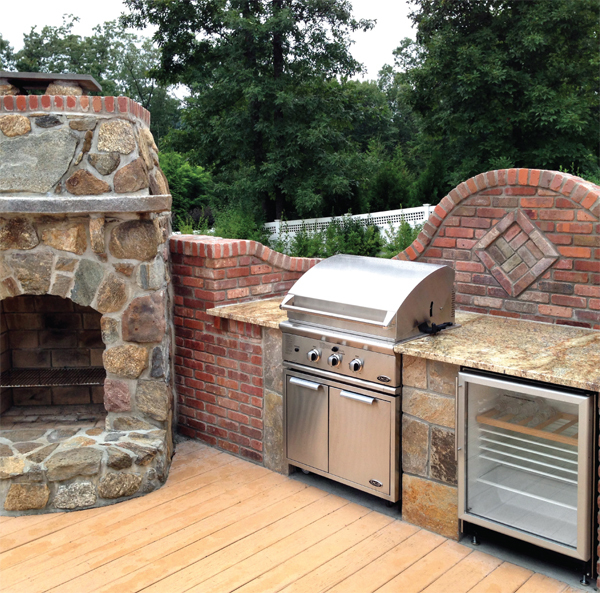 Gotowala continued his use of brick in the raised backsplash and used sunken stone in the patio. The luxurious feel of the space is heighted by the reconstructed fireplace, beverage center, pond, and hot tub. With every need anticipated, the homeowners are able to just sit back and relax.